Plockton is a holiday destination in it's own right and many of our visitors spend much of their holiday here. But there's more than that and within just 50 miles there is so much to see and do. If it's walks or wildlife, mountaineering, browsing our shops or galleries there's something for everyone. Add to that some of the best food and drink in Scotland from a Michelin-starred restaurant just across the water in Skye or our cosy hotels and restaurants here in Plockton. 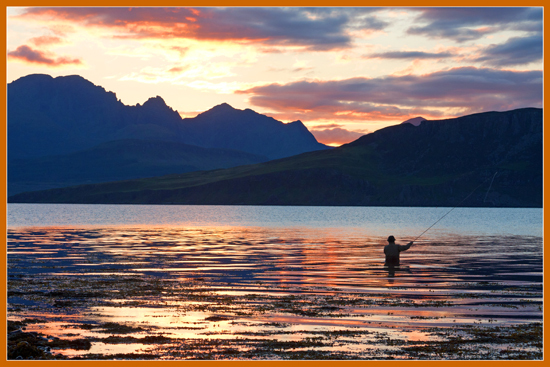 You can learn to sea kayak, take the scenic train to Inverness, or explore the mountains of Skye and Torridon, or cruise the waters of the west coast to see whales,dolphins, otters, eagles and much more. To help you plan your stay with us and give you a taste of what's going on we've shown below some of our recommendations in and around Plockton and a little further afield. If you need to know a little more just give us a call. For over 30 years Calum has been operating Calum's Seal Trips taking visitors out to see the seals and wildlife in the waters of Lochcarron. Operating from Easter to October the one hour seal trips have a unique guarantee, 'free if we don't see seals', and during the season the 'Sula Mhor' has evening music and fishing cruises, can be chartered for a wedding, or private charter. Plockton was once a major fishing port, but now just a few boats ply the waters, or try fishing yourself off the pontoons and rocky coves. Each summer in late July and early August the village hosts the Regatta, attracting sailors and enthusiasts from all over the west coast. Plockton and it's immediate area is wonderful for walking and hiking. There are numerous walks around the village or for the more adventurous you can climb the hills nearby with some amazing views inland to Lochcarron and the east or west to the magical Isle of Skye. You can pick up some ideas for walks in the village shops, or click on Walk Highlands. Eating out is always a popular pastime in Plockton, and our hotels and restaurants stock a wonderful array of fine wines, locally brewed beers and some of the finest malt whiskies that you can find in Scotland. It is advisable to reserve a table and in July and August even a few days in advance. The Plockton Shores is a very popular restaurant and is next door. The Plockton Hotel is just a few yards along from Mackenzie's open all year for formal dining in the restaurant, or delicious pub meals in the bar, and specialising in superb freshly caught local sea-food. The Plockton Inn is popular with locals and has some of the best sea-food on the coast, or try something special at Plockton Shores, bistro dining on the waterfront. Enquire about the famous Plockton Brewery, an award-winning micro-brewery offering some superb beers from IPA to dark ale. And Plockton has it's own take-away fish bar for a great fish supper. In nearby Erbusaig the Tingle Creek Hotel is open all year. Plockton is a mecca for artists and craftspeople with galleries and exhibitions, open through most of the season. The first stop must be 'HiddenTreasures', our gift shop of the seas, situated right next door to Mackenzie's, with a great choice of gifts, souvenirs and all things connected with the sea. You can buy tickets for the Seal Trips here, and rent a kayak or boat from Plockton Boat Hire, our own sailing school.The Studio on Innes Street is a gift shop and gallery. Eilean Donan Castle just over the hill in Dornie is one of Scotland's most iconic castles. Spend a day and explore the restored castle and its exhibitions or browse the visitor centre, shop, cafe and photographic exhibition. A day out for all the family. This is just the start, head out of the village to see and do even more. You are spoiled for choice in Plockton alone, but travel a few miles and experience some of the great places to see and things to do that the Highlands have to offer. Perhaps start across the Skye Bridge just a 10 minute drive away, and head up the 'Misty Isle', often voted as one of the five best islands in the world. Many people head first for Portree, the main town, with its pretty harbour, shops, galleries and hotels and pubs. During the summer you can take a boat trip to see the sea-eagles at the nearby crags, or watch the boats ply the harbour. Further north on the road to Staffin, you'll pass the famous Old Man of Storr, dramatic scenery reminding of 'Lord of the Rings'. Further north drive across the Quiraing, an amazing landscape of rocky pinnacles, massive ledges and the Trotternish Ridge, the largest natural landslip in Europe, formed millions of years ago. Head on round to Waternish, via the Fairie Bridge, or visit Dunvegan Castle, ancient home of the Clan Macleod. Skye has so much to see and do, you won't do it justice in a day, but at least visit Talisker, the only distillery on the island, Glenbrittle, gateway to the Cuillins, or to Elgol, at the end of the road from Broadford. Elgol is the base of 'Misty Isle Boat Trips' which take visitors across Loch Scavaig to Loch Coruisk, deep in the heart of the Cuillin Mountains. In the south of Skye is Sleat, long known as 'the Garden of Skye', with its rolling hills, rocky coves and sandy beaches. At some of the high points you can almost see forever. Take time to visit Clan Donald Skye, ancient seat of the Clan Donald, and home to Armadale Castle and Gardens, the Museum of the Isles, a shop and a restaurant. SEALL, Scotland's liveliest rural events group, based in Sleat, produces over 40 concerts a year at Sabhal Mor Ostaig, Scotland's Gaelic College. Travelling east and north from Plockton you'll find the Wester Ross Coastal Trail, a 150 mile road trip from Lochalsh up to Ullapool, via Lochcarron, Kishorn, Applecross, Torridon and Gairloch. This is wild country, with some of the highest mountains in Britain and the Beinn Eighe National Nature Reserve. Not for the nervous driver the Bealach na Ba pass to Applecross at 2093' is the highest in the country, recently voted by National Geographic Magazine as one of the best road journeys in the world, and in the same league as America's famous Route 66! Have lunch at the Applecross Inn or see the sandy bay made famous by Monty Halls, in his Beachcomber Cottage tv series. And lastly try and pay a visit to Glenelg across the Mam Ratagan pass with its ancient brochs and popular Sandaig Islands, the Camusfearna of Gavin Maxwell, who lived there with the otters, and wrote the classic 'Ring of Bright Water'. With all that there is to do a few nights stay won't be long enough but you can return, like many visitors, again and again. If we can help with planning what to do when you are staying with us, just let us know. Have fun!